Transport your cargo on demand with no wasted time. Your parcels are taken care of, for an urgent delivery. 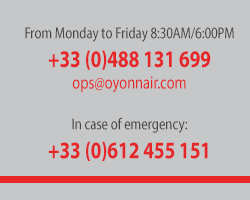 Oyonnair offers an aircraft adapted to transport your urgent parcels to any destination. Ranging from urgent mail to single or multi- piece shipment, Oyonnair takes off as soon as the loading is completed. Oyonnair has a specific agreement to carry radioactive materials for use in medecine (type UN2915). Crews are trained to ensure transportation and handling of these goods safely.